The quiet Ariege town of Saint-Girons is situated west of Foix and south of Cazeres in a region known as the Couserans, an attractive region of wood covered hills where the plains of Gascony meet the mountains of the Pyrenees and close to the ruins of the ancient city (and current village) of Saint Lizier. The setting of the town is enhanced by its position on the river Salat at the point where it is joined by a smaller tributary, the Lez. The heart of the old town is very characterful and a pleasure to explore, with a decent sprinkling of attractive buildings and shops to admire. 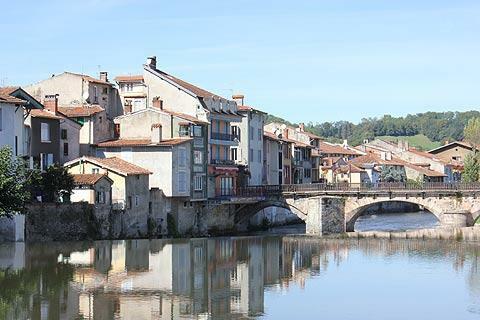 Saint-Girons is less a tourist destination and more a vibrant local town, and parts of the town are rather neglected, but a visit is still worthwhile. 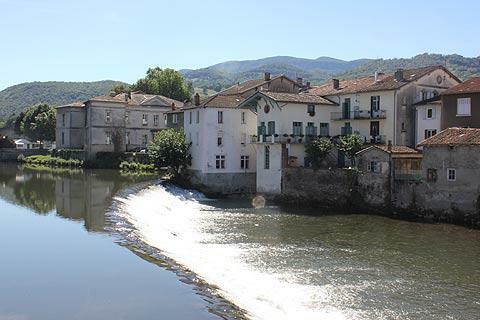 Start your visit at Saint-Girons tourist information office, in the centre of the town next to the river, where you can get details of a suggested route to follow which ensures you see the highlights. The most picturesque part of a visit is the walk along the riverside and quais, then across the old bridge to the park and the Palace of Justice (originally the Chateau of the Vicomtes of Couseran). Saint-Girons church is close by and stands on the banks of the Salat River, with its 15th century belltower dominating the view along the riverbanks (although the main church is more recent, not built until the 19th century). The church was built on the site where Saint Girons was buried. The surrounding streets leading to Place Pasteur contain several houses featuring open upstairs balconies, a traditional local design. Continuing into the Boulevard Frederik Arnaud, at number 28 you can see a part of the original fortifications of the town. Cross the bridge here to see the unusual 'monument to the dead', a tribute to those who lost their lives in the war and an unusual design with a statue of a grieving widow. From here follow the west bank of the river through Saint-Girons, through the Place des Capots, to reach the substantial Castle of the Viscounts and a garden area. 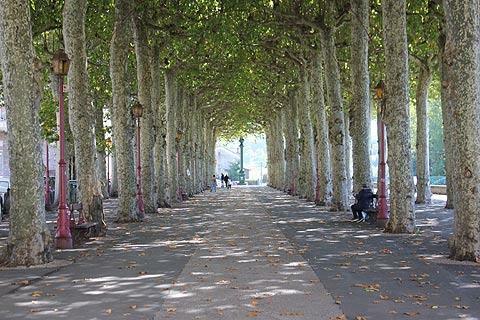 Cross the river again to reach the Champ des Mars, a tree filled area where the market is held each Saturday in Saint Girons. There is a popular cafe at one end of this large square. At the top of the boulevard Noel Peyrevidal, on the Place du Mai 1945, Saint-Valiers church has a 12th century facade while the rest of the church is largely in the gothic style. 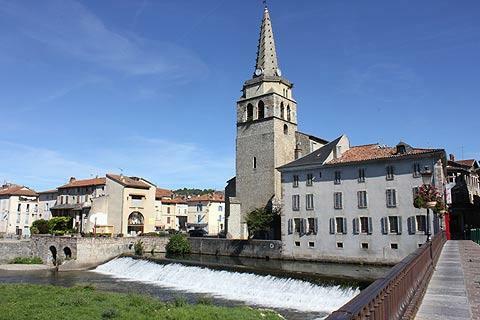 Turn left to follow Rue St Valier through the old town and to continue back to the river and your starting point. The location of Saint-Girons and the surrounding valleys (it is known as the region of 18 valleys) make it very well placed for exploring the Couserans, ideally on foot or bike. to make the most of your visit to this picturesque part of the Ariege. 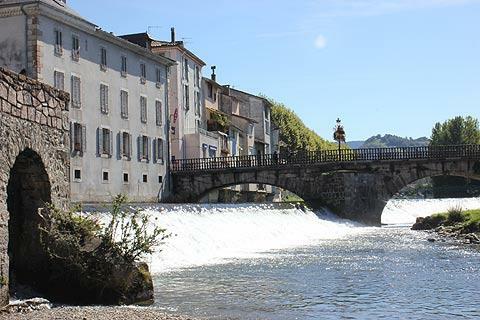 The village of Saint Lizier just two kilometres away was for a long time the home to an opposing family of lords in the Couserans - it is now a picturesque village classified as one of the 'most beautiful villages in France'.